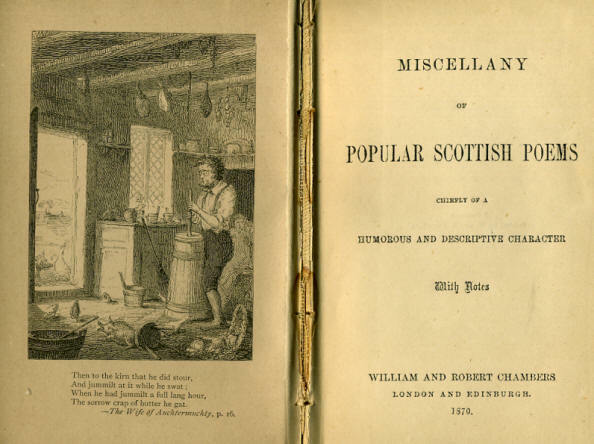 The present Miscellany comprehends chiefly poems of comic nature, or such as are descriptive of rural life, manners, and customs, including the best writings of Macneill, Alexander Wilson, Mayne, and others of our lesser stars. Most of these compositions have already received the stamp of public approbation, and have been frequently reprinted while a few are, from various causes, less known. It may perhaps be said with safety of the whole, that, though many verses are rough and homely, there is in the mass of them much humour, and no small narrative and descriptive power. The notes to these poems, excepting in the cases of "Peebles to the Play" and "The Wife of Auchtermuchty," are by the respective authors.